It is a new approach to the treatment of asthma. It is a recombinant humanized gamma immunoglobulin (IgG)1 monoclonal antibody that is targeted against the portion of IgE that binds to its receptors (FC -R1 and FC -R2 receptors) on mast cells and other inflammatory cells. 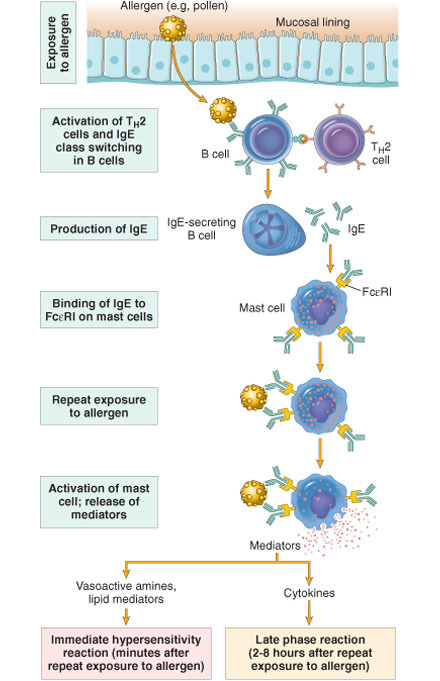 It inhibits the binding of IgE to mast cells but does not activate IgE already bound to these cells and thus does not provoke mast cell degranulation. It may also inhibit IgE synthesis by B lymphocytes. In addition, omalizumab causes down-regulation of IgE receptors on mast cells and basophils. Administration of omalizumab to asthmatic individuals for 10 weeks lowers plasma IgE to undetectable levels and significantly reduces the magnitude of both the early and the late bronchospastic responses to antigen challenge. Repeated administration lessens asthma severity and reduces the corticosteroid requirement in patients with moderate to severe disease, especially those with a clear environmental antigen precipitating factor, and improves nasal and conjunctival symptoms in patients with perennial or seasonal allergic rhinitis. Omalizumab's most important effect is reduction of the frequency and severity of asthma exacerbations, even while enabling a reduction in corticosteroid requirements. Omalizumab treatment reduced exacerbations requiring hospitalization by 88%. Omalizumab is recommended in the guidelines and in a recent review for asthma patients with allergies whose asthma is not controlled with long-acting beta agonist, high-dose inhaled steroids, and leukotriene modifier therapy or when the use of those medications is associated with intolerable side effects.